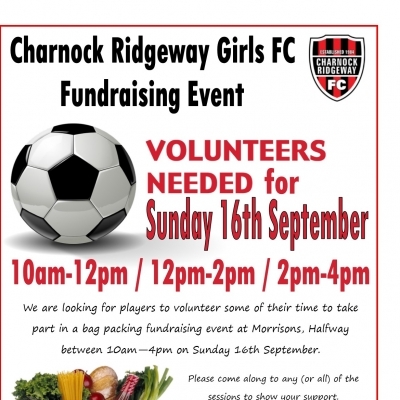 We are looking for players to volunteer some of their time to take part in a bag packing fundraising event at Morrisons, Halfway between 10am—4pm on Sunday 16th September. Please come along to any (or all) of the sessions to show your support. Fundraising for our club is important to allow us to purchase new equipment and fund extra activities for the girls. Please confirm your daughters attendance either on the Facebook post or in person to Natalie, Clare or Sally at training. Please ensure Charnock training tops are worn to help promote our club.